Hope everyone has a great weekend! I'm waiting for the dentist office to call me back. I am needing to get in and see someone soon. I have a horrible tooth ache and i was up a lot last night from it. I sure hope i can get in today. Well there not getting me in until Tuesday. WONDERFUL. Every weekday between 2pm-5pm, McDonald’s will be offering drinks 2 for the price of 1. The drinks included are lattes, McCafe’ mochas, cappuccinos and soft drinks. Not quite sure when this offer will end. I needed some more Strawberries now that my family is hooked on those smoothies. Todays freebie is FREE Coffee From Panera Bread. I went to Walmart & Bakers. I'll post my walmart trip when i find my receipt. Today is a good day so far, no complaints yet, lol. I have been making some meals today. I have made 2 meals from one. I am making Turkey Noodle soup which i will freeze and i am making Turkey Pot Pies and we will eat tonight. Freebies for today is.... Free 2 liter or 20 oz. 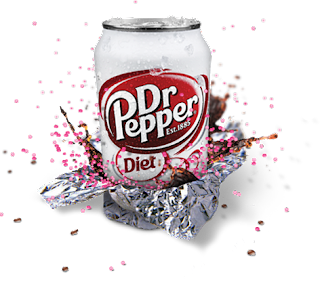 of Dr. Pepper! I have no Bob's here but remember it growing up. *Blend with or with out ice. I didn't use ice and i used orange juice. I wanted to use pineapple but we didn't have any. It's Hectic Monday again. Everyone starting the new work/School week. Sorry i had not posted for a few days. Took some time off to spend w/ the family. Yesterday went to the grocery store and we spun out because of the snow. We didn't get much just 3 inches and we thought the roads were pretty much clear until on the way home. We went down 72cnd street and there was a slick hill there. THANKFULLY there was enough room in between cars that we did not hit anyone. There was 1 truck and he moved way over for us when he saw us spinning. My nice hubby stopped the car he slid it into the snow off the side of the road, otherwise we would not have stopped until we hit something. If we would have slid much further off of the snow we would have been in a ditch too. It was more than scary especially when we saw traffic coming into us and they could not stop. A man finally stopped and then a car almost hit him because he was not paying attention and going to fast. We went home and stayed home. Needless to say were tired of snow now. The snow has been on ground almost everyday since before Christmas. Ok, going to move on about something else now. I am having my 1st give away!! I will run a contest from 1/26/09 to 2/02/09. I am giving away 50 coupons. All you have to do to be entered into this drawing is... Subscribe to my site or post a message. Free code for Monday, January 26th is 57VH9L and expires at midnight. 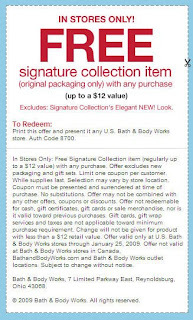 Here's a goodie for you today from Bath & Body Works. I hope your having a good day today! I'm having a hectic day today. Cleaning and cleaning. I have so much clutter in my house that it's keeping me awake at night thinking about it. I have my Kitchen all clean now. I will work on the living room area tonight. I wanted to share a nice cause and freebie with you today. Free Pancake Day at IHOP, It's for a good cause. Ok, not really a Freebie but it's cheap and for a good cause. We did this last year. Service was a little slow but not bad. Known also as Fat Tuesday or Mardi Gras, National Pancake Day dates back several centuries to when the English prepped for fasting during Lent. Strict rules prohibited the eating of all dairy products during Lent, so pancakes were made to use up the supply of eggs, milk, butter and other dairy products…hence the name Pancake Tuesday, or Shrove Tuesday. 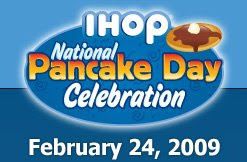 Since beginning its National Pancake Day celebration in 2006, IHOP has raised nearly two million dollars to support charities in the communities in which it operates. With your help, we hope to raise $1,000,000 for Children’s Miracle Network in 2009! Today i went to 2 Grocery Stores. Bakers & Walmart, i usually shop there and sometimes hit some other stores depending on the sales and my budget. 2cnd Store Walmart- Now i really hate to shop here, but i do because i maximize my savings by price matching here. However my shopping trip was more manageable this time since my favorite guy cashier was working. He's gay and so funny and so nice. He never questions anything and cheers me on and congrats me when i am done shopping. Really he is too funny. Oh today is a crazy day. We overslept this am and had to rush everything this am but daughter still made it in time to school. So after she left i had only 30 min to get son and i ready before heading to Sams club. Tomorrow is the last day to get the membership for $40 and a FREE $25 gift card. So my MIL and i split the cost of membership and i only had to pay $20 plus we split the difference in gift cards and that made me only out $7.50 for my membership then. Sad part is i was broke so i couldn't buy anything, LOL. All i bought was a Big Sunny D drink for $2.86 and our lunch for $4.86 for my son and i. 75% OFF right now and shipping for 2 items is $5.99 Plus you can use coupon code SIZZLE to get an extra 15% Off !! Today starts the week for us. Kids out of school today, going nuts. Let's see what i can get done today, lol. 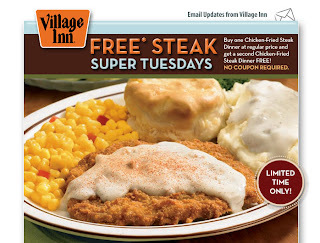 Here is a nice deal if you dine out to Village Inn. -1 kids meal and you are paying for 2 dinners. 1 kids meal and 1 chicken dinner i pay for. The other 2 would be free. My local HyVee grocery store has Prairie Farms flavored milks clearanced to .99 cents each. Use the -.30 coupon and it makes it .69cents or the $1/3 = $1.97 for 3. You can also sign up for coupons on there site. It's Friday!! Yeah made it through another week. And Yeah ,my pipes are no longer frozen! It's still chilly here. Not as bad as it had been. If it weren't for the wind it would be ok. Right now it is 9 outside. Going to try to make a different batch of laundry soap today. I spent all day organizing my bathroom yesterday so i didn't get anything else done. I renamed today because it has turned fabulous, lol. I put a complaint in to out local Bakers store because i had a RX filled and they did not deduct the amount they should have and i waited for over 1 hours for my RX and there were only 3 other customers who had come and gone. I pick my battles when it comes time for putting a complaint in. I just felt this one was needed. So after talking to the manager today he said that they would refund the amount owed and he apologized. So i now have a $20 gift card waiting for me to pick it up. I will do so today. Also, the manager was really nice, however i told him i will not transfer any more rx's there. I will only buy my groceries there. So complaining to companies when needed does get you somewhere. Just remember to follow up w/ a compliment if they try to make your complaint fair or right. I sometimes compliment companies if i have received good service, food, etc. I once received a coupon for a free jar of pickles any size valued to $5.99 Well the largest jar at Walmart was $4.99. So i was happy. Here's a few goodies to get your weekend off right. (note it is not working yet as of 9:37am CST. Today is really cold here. It was -15 this am. Now it is -9. I really think school should have been canceled. That not my daughter has far to go, but think of all those poor kids having to stand out in that cold to catch a bus. Some kids show up to school between 7:35-8:00am and School will not let kids in until 8:45am. No safety patrol out today either since it is so cold. I have no water in my bathroom, only cold in my kitchen. I sure hope my pipes will be ok. I really would also like to take my shower today. I made my laundry soap yesterday. It didn't turn out like i was hoping for. I think because i stirred it before i should have. So i will try it again w/ a different recipe. I also did not get my bread made, lol but made Hello Dolly bars yum. So that is what is going on in my life today. Here's hoping where you are you will stay nice and warm. I will try to match up coupons later. -$1 coupon from 01-04-09 paper =$9 unless you have printed the $4 IP coupon then it would be $6. The $4 IP coupon has been pulled. I am also going to cook a ham dinner today then later use the left over ham for bean soup. I will be trying to make cinnamon bread today as well. We might play some board games tonight after dinner. Get a FREE bottle of Suave Shampoo today only!! If you are on your way to Toys R Us, pick up a free calendar. Veggie Wash is the all-natural way to remove wax, soil and agricultural chemicals from produce. Please call 1-800-451-7096 to request a FREE sample bottle of Veggie Wash. Be sure to leave your name and address. Please allow 2 - 4 weeks for delivery. There is a coupon in the 1/4/09 Smartsource (from the Sunday paper) for $3/2 lunch entrees at Red Lobster. It expires on 2/19/09. Combine this with the new $6.99 lunches and you can get 2 lunches for $10.98 or $5.49 each (get it to-go with extra biscuits). Lunch is served until 3pm. I went to 2 stores today. I went to Bakers & Walmart. I price matched everything at Walmart and what i didn't i bought at Bakers. It has been brought to my attention that people may get the idea that were only eating Shampoo , lol. No were not i assure you. Or that we are eating out a lot. So i have decided i will post a weekly menu each week of what were having. I have some items that i have stocked in my pantry. We try to eat as much as possible from the Fridge and the pantry. Thursday-Roast beef w/ carrots, potatoes, tomatoes, green beans, celery. Here are some good deals for this upcoming ad on Sunday. Now keep in mind there are other deals but these are the deals i think are good or i may be buying. When presenting your IVC coupons present MF coupons first, and IVC coupons last. -$1 internet printable = $1.79 for 2. If you were divide by 2 = .89 each- good deal. Scrubbing Bubbles shower kit $14.99-$5 MAIL IN REBATE =$9.99 -$4 coupon =$5.99 you can print coupon from there site or homemade simple site. 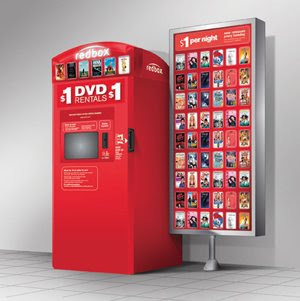 IVC Coupon Bounty Basic .89 a roll -.25 coupon =.64 cents a roll. Buy 6 boxes for $12 (minus $6 in coupons) and get $2 RR so that is $4 for 6 boxes. That is 67 cents per box. there is a $1 off Fiber One toaster pastries coupon in SOME of the 11/16 SS (mine was only 70 cents but database shows a $1 one out there) and there was a $1 off coupon that was mailed with a sample so you could get them for 67 cents a box too. Another trip to Walgreens. I was hoping they would have my Progresso soup, they did have some but not the kind i wanted :0( I also mainly went because i needed some nose spray. It's very dry here. Of course i had to buy some more stuff, someone just slap me. Cottonelle Wipes $1.99 w/ Walgreen Q.
Gor a $10 RR to use on next order and there was a rebate in Sundays paper for this stuff. So i am not counting this stuff in my budget because i am getting it most of it back by rebate. $10 Rebate =$10 OOP if you want to count it. I rolled It into next order and got back a $5 RR & $4 when all was done. Walmart shopping trip today and items i price matched. Not a very good shopping trip. I hate to post it, lol but i have to if i am keeping track of everything. spend $25 or MORE on participating P&G items get $5 off your order. There may have been a few items i forgot to add as well, but total does not go up. Items i need to subtract from my budget are..
Total $4.38 I've included tax in that as well. Hmm, more thinking technically i should only be spending $62.50 a week in order to make the budget work. If i were to go by that then i would be over budget by $9.77 this week, and i still have to buy a package of hamburger meat. So i would be over budget by $16.59- Oh how dissapointing, i think this budget thing may be harder for me than i realize. Especially since i live in LOND.